I’ve decided that the best format for this would be to take each one individually and rate the leader and sub value of each (given NA October 2018 Meta). In the closing paragraph I will offer my opinion on which one is “stronger” than the other for chase reasons. For the rankings I will choose (in my opinion) the best form of each of the witches. Her base form features VDP among relatively tame awakenings. When she came out she was arguably the best Wood VDP, however, we’ve gotten Bride Rushana which is strictly better for farming purposes and has a low CD active to allow flexibility in the active you’re using. Other far more broken VDPs have come out as well (namely Saline and Suou) so this form of Zela isn’t making a big splash for me. Her leader skill is a worse Kurama. HP conditional damage and shield (50% condition) and orb hungry full multi scaling from 6 to 8 orbs for a max 144x. Simply lousy for both farming and clearing purposes. The potential for this form was completely in the VDP and active. The 16 turn active is a full unlock, +2c and bicolor hearts and woods. The +2c is very welcome considering most bicolors range from 5 to 7c when matching a VDP… Except she has no 7c in this form so the extra cooldown tacked on for that is irrelevant outside of a marginal +0.5x added onto the overall combo multi. Frankly this active would be better suited to bride Rushana for VDP purposes. This form could be used as a sub on a Kaede swipe farm team as the active can give you an unlock, +2c and board (triple effect makes it efficient) to get you through an annoying spawn like Grato, however, randomized boards have very low favor in farming because it can effectively kill a run on a bad board. This form switches from rows and VDP to a “superior” Amatsu. What this means is that we have the first triple 7c and FUA card in the game. I was excited when this came out. Slightly better typings (with respect to killers available) but lose out on HP. In the last section I discussed the value of this active for the triple effect (however value for such a long active is completely tied to the team running Zela and that’s an important note). Given 7c is overly powerful (go watch this video for a mathematical look at it) and combo teams are all the rage, this card fits in perfectly. Even as a generic card to drop on any team as the FUA, Zela packs a hell of a punch with her 7cs and potential for god killer latents. Against a god type enemy she will actually hit as hard as No6 or just under what Viz would hit with God killer latents. Add on the fact that Zela will have 8x against anything making her more versatile for damage. As a sub, where does this even fit? Actually a lot of places. The unfortunate part is mostly that wood is lacking in general right now. This form of Zela slots in perfectly on Kaede teams, giving you enough damage to kill most spawns with just 3 woods and a board clear while also providing an amazing active. She works on any teams that are more combo oriented like rainbow. However, her active is restrictive to say the least. 16 turns is not very effective to assist over. A gemstone would be 30 turns away which is more turns than floors in A3. Wood also doesn’t have that much support when it comes to filling slots on a combo team, however, it does have Cotton which fills a similar role to Zela. Outside of Cronus and bride Rushana, very few valuable wood cards have come out (no I didn’t forget about Vraska / Gronia / Fujin). And a wood – heart bicolor means that you can’t activate Gronia (where Zela is off typing anyway) or Vraska so again, a niche active. You can’t use the active for rainbow unless you plan to use a board right after. Zelas active which makes her a nice triple effect is also her limiting factor in many ways. This slots her better into combo based (Anubis / Ed / Bolas, etc) or on wood centric teams like Kaede or, well, herself. As a lead she is like Ed but add on the difficulty of needing multiple wood combos to get the multiplier which is a pretty bad trade off in my opinion. The orb hungry nature makes her unsuitable for 6×5 which would leave your best pairing at Diablos. While Diablos is still suitable as a leader it’s nothing different over the standard combo 7×6 teams that we see. The lower shield from Diablos can also mean less shielding in prempts meaning you’re more likely to get knocked under 50% and lose your shield / damage. Unlike Ed, you don’t have a heal active built into your leader and depending on the enemy, you’ll need one. As a leader, neither form is particularly interesting. As a sub the evod version is very interesting and fills the FUA role unmatched for damage and the triple effect board active (if her active fits the team). Honestly this form is worse in every way for the purposes that you would normally run Reeche. This form has TPAs instead of 7cs and the leaderskill forces you to match at least 4 waters together (i.e you match TPAs to activate and can blue box). The other key differences are that there is no time buff in the leader skill (which is curious and I’ll touch on that when I talk more about the evolved version) as well as only needing 3/6 of the orb types to activate the rainbow portion (the evo needs 4/5, hearts are excluded). This makes boxes significantly easier to make with something like Toshiro > double row for a guaranteed 8c VDP with 3 colors. Does that matter much? In general, you can guarantee yourself at least the box and colors with a rainbow board + double orb changer (like Hermes) for the evod version of Reeche. The active is a quad effect of unlock, board, attribute absorb void and damage absorb void. It is the only way that you can actually have attribute absorb void and damage absorb void up at the same time which makes her active both versatile for the different absorbs you can face in end game dungeons and the only thing that answers both of Kanna’s absorbs. Given that it’s a quad effect the cooldown is appropriate at 30 turns. However, the double skill charge on either form of Reeche can mean that this active comes up in a measly 10 turns. Overall, the base version of Reeche is not interesting as either a lead and especially not as a sub because 7cs are strictly better than TPAs. Without repeating the same points about her active being broken, let’s cover the awakening buff. We trade the 3 TPAs for 2 7cs and a TE. The leader skill also changes to be combo and rainbow based with a time buff which is why I said it was curious that the third TPA was traded for a time extend. The extra time also simplifies some spawns like Dark Izanami, Lakshmi, etc. The damage goes up too which overall brings Reeche to be an amazing rainbow lead with easy activation from any 4 colors and 7 combos which synergizes perfectly with her awakenings and active. She is a great lead for late or end game content with the right subs (rainbow sub pool is very extensive) given her fast rotating active that answers attribute absorbs (a problem for rainbow) and damage absorbs (Sopdet / Parvati / Starling / vishnu / heradra). To add on, with Reeche as each lead, you could, in theory, use a Reeche every 5 turns with the whole unlock, board, and absorb voids added on top. The whole package synergizes very well. She’s not particularly amazing in dupes besides inheriting onto herself for SDR purposes. You can run maybe one as a sub but it would force the rest of your subs into an awkward niche to run anymore (since afterall you still need to fill colors). She can work well as a sub for other rainbow teams but overall I don’t even think I’d run any current rainbow leads over Reeche. Yet another 4SB card, Madoo is a new leader type where you just have to match x of any orb type for the multiplier. It can be hearts, jammers, poisons, a color you don’t have, literally anything as long as you meet the requirement for x. The base form has a requirement of 6 which is unfortunately more than the average you’ll have of any given orb type. There’s no typing or attribute requirement either to get the 225x meaning that the subs can be very versatile and you can activate relatively consistently. Her active is pretty lackluster and doesn’t fit in with her awakenings or leader skill. Generic 2 turn delay, +2c which actually makes her active a long 14 turns which is really bad for assisting over. I don’t see this ever being used as a sub for clearing but could potentially used for farming in a build that has a lot of SB to forgive assisting over Madoo but I don’t see that ever being a hard requirement. This form is where she shines more in my opinion. The leader skill drops the linked orb requirement to 5 orbs which is significantly more common (it’s impossible on a 5color+hearts board to not have a 5 match while it’s technically possible to not have a 6 orb match) which allows for consistent activation turn after turn. Given it’s less linked orbs, the actual number of moves should be lower as well every turn. There’s no combo requirement, instead we get the imposition of fire requirement which hurts (but not as bad as a combo requirement that the base form has). For long dungeons that can’t be swiped (and that don’t have insane damage requirements like AA) she trivializes the turn by turn to be hands down one of the best farmers for dungeons like A3 and the current Endless Corridor Challenge. She loses her rows and some SB for 2 VDP and 3 TPA. I was confused at the pairing at first but then I realized that the main purpose was to be able to match a 5 match of whatever orb type and make a fire TPA for significant damage on a two combo. When it comes time for needing a VDP (such as radars in A3) then your leads already have a VDP built in. She can also take god killers which is nice against the all-but-one god typing radars (with the one being Gaiadra where you have attribute advantage). She’s not a fantastic sub given Rodin release with a far better active and keeps the double VDP. Overall I highly rate the ease of use of Madoo as well as her move efficiency for longer dungeons earns a spot as my go-to teams for arena. Nothing to write home about. Very clearly designed to be an exp farm lead. If we had female titan maybe we could see non-lead swap Machine farm setups. Either way the standard will still probably red row swipe with leader swap for exp farming where Saline’s long active hampers the ability to assist over. She has no worthwhile awakenings to really speak of. The full light board active means that we finally have a full light board for every color. She’s also the third inheritable full board following Toshiro (2016?) and Satan (who has a button and HP reset portion). The unfortunate part about Saline is her active is longer because they stacked on a 2 turn haste. At 19 turns, most farm teams will have this up when running it as a base. However, assisting over a 10cd card would pose a heft 29 turns of charge which can be difficult. Base Saline is not a sub whatsoever and purely an exp farm lead. It’s to be determined if she can replace Ganesha for this purpose given the 6 turn difference in actives. This is the form that shines. I was originally a bit skeptical of this form given we have been receiving a lot of VDP options like Yusuke, Yu, Bride Rushana and Valentine’s Ney (all of these are balanced meaning any latents). Her main purpose is to be a VDP stick so it’s worth comparing her to the top options of other whale bait collabs and seasonals (since it’s frankly easier to get a seasonal or collab with trading and higher rates). I’ll start this comparison by reminding the reader that VDP is 2.5x, 7c is 2x, killers are 3x. 7cs like on Yusuke or VNey provide easy and consistent damage for the combo teams of 2018. A single 7c provides general 2x and double 7c provides a general 4x which will always be relevant. The benefit and downside of 7c on a VDP application means that you need to have your VDP board in a specific distribution for a natural 7c, otherwise you’re relying on combo+ actives or orb changers to fix the board to get the distribution you need. For example, if we take a Yusuke board, a perfect split if 15-15 is a max of 6c with VDP. For VNey active you could simply not even get 9 darks for the kill which again means some form of board fix or other method of setting up the board. Then we head into multi-VDP cards like Yu. VDP does strictly less damage than a relevant killer awakening (3x > 2.5x) and we can’t forget that the VDP awakening does no damage on a regular basis which means slack to pick up by other subs. Yu active is also a bit potato and you’ll likely need to assist something over. For the reason that multi VDP doesn’t do much for the rest of the dungeon, I tend to not rate it too highly. Then we get to killer VDP combos. Having one relevant killer already outdamages a second VDP. It falls in-between the damage of a single and double 7c (meaning it can do less damage than a Yusuke / VNey). However, when we analyze the killers of Saline we see that she has the 4 main types and a balanced killer. Having the 4 main types means that she will effectively always have a killer for every endgame VDP application currently out. Stack on that it’s possible she has double killers like in the case of the A3 radars for a whopping 9x before factoring in VDP or latents. The killers will also be relevant throughout the dungeon for damage purposes just like 7c will, however, she will be a bit potato on those off-type enemies like Ibaraki. Killers also mean more flexibility in board setups. If we recall the original Yog carry teams for 3p UDR, the same 3 actives were always used (Yog into Anavalk to make a full enhanced light into BMyr or HXM) and the only difference was based on the boss to determine how to match the board. For example, Nyar would mean make 2 rows of lights split by the hearts, Cthulhu would mean make a FUA in the middle of the board, Azathoth would mean forming a box out of lights using the heart combos. All of the end results were 3-4c which meant that killers really won out for this purpose (Cloud was the go to) showing just how strong killers can be on VDP applications. This also leads me to discussing her active. I just mentioned that the 3p UDR teams used 2 actives to make a full light board, now we can skip one active and go straight to the full board. If we consider the previous VDP options discussed then we must discuss the efficiency of Saline’s active. All the other VDPs I wrote about here face inconsistency in their actives. You can’t guarantee the distribution of a Yusuke board. If you use a second active to change Yusuke to a full board before comboing into a double row active we lose one active in efficiency. If we assist over then the result is an active that is longer than Saline (less SB efficient). The final point about the active is that for farming purposes Saline active is actually relatively short meaning you could actually have a more SB strict team and the two haste from Saline will haste the active you need to combo with her board for a 100% consistent VDP application with 2 actives with lower SB requirements than the other VDP options. Overall, Saline has earned a spot as my go-to VDP for the easy board and killer efficiency. This form of Velour is just a mishmash of all awakenings in the game. FUA, double VDP, 7c, team HP, team RCV, SB, SBR. Throw it all in! This form is clearly designed to be a sub for either a dark or combo team. The active is good and bad and and worse and finally good at the same time. You start by seeing the double orb changer which tends to do well for comboing off another active. Then you realize it’s two colors and not color + heart which gives it some uniqueness and that means you can save yourself hearts while generating orbs. Then you see the greatly reduced RCV clause (likely meaning 75% reduction) for 1 turn so why even bother with hearts anyway. Then you see the 5 turn cooldown which fixes the problem that Zela had regarding being a well-rounded general FUA slot. So as a sub this version is interesting as a generalist that can work on any team that allows for darks. She also brings something unique in the leaderskill. We saw Saline give an exp boost and Velour is giving a drop rate boost which is the first of it’s kind. We don’t currently know how much it will actually impact which will heavily change the value proposition of Velour for farming. Is it something where we can lead double Velour and button Int for a collab / seasonal and get the boss drop? That could save a ton of stamina and time. This part of the value is to be determined. Why are they trying to push combo orb meta? This form drops all those great awakenings on the sub version and instead brings three rows and a combo orb awakening. For those unfamiliar, it’s a new awakening that was announced a while back but that we haven’t seen implemented (until now of course). You must match exactly 12 orbs in a blob. If you accomplish this you get a special orb from Skyfall that provides +1c when using that orb in a combo. The orb is a random orb (colors + hearts) and similar to OE, if the orb is converted to a hazard you lose the combo effect. You do not get any damage boost for matching the blob of 12 and the combo orb can Skyfall and be removed the same turn that you blob the 12. Further, you can only have a max of 3 of these on the board at any time. All of these restrictions makes this a pretty potato awakenking that won’t really have any impact on the meta (if we were able to get more we could see much more powerful farm builds utilizing it). However, for a combo and row based lead (think Morrigu) you’re left with 18 orbs after the 12 blob to make 4 more combos. Assuming you used a double orb convert that means you have 4 orb types on the board and every orb type can have up to 2 leftover orbs leaving a minimum combo of 3/4 that you need. Chances are this probably won’t happen too often naturally but mix in hazards and you can get caught more. This is where the combo+ comes in. If you have one you can chain a guaranteed 12 blob per turn with 5c. But how do we chain 12 darks turn after turn? Let’s go back to the good>bad>worse> good active. The two good points are the double orb changer and low cooldown. On a natural board the average orbs will be around 12 or 13 darks after using a double orb changer. That stacked on the 5 turn cooldown means that if you can bring 3 more Velours on the team you could use one per turn and get the combo+ awakening off almost every turn. The bad and worse parts of the awakening are directly offset by the leaderskill being a 9x RCV lead so even with a 75% reduction you’re still rocking a 1:2.25 HP to RCV ratio. On first glance I mostly disregarded this card (which Gung-ho said was supposed to be the new meta) and didn’t think much else of it. I can see the meta in this case is designed to be super whale to accomplish and I’m sure he (or she) who makes the team can have a good time with it. I’m still not convinced that it will do well in end game given that you’re dedicating 5 actives to upkeep this system (at a minimum you’ll need 4 actives for a system to activate the leaderskill every turn otherwise you don’t have a shield) which leaves you one leftover active. This is not particularly useful with the piles of mechanics we need to deal with like color absorb, damage absorb, and awakening binds. At an average of 1 per 200 rolls, you’re 800 rolls away from even making this (on average). Is this leader going to be relevant? I’m going to bet no given the 6 dark requirement per turn which requires either a 5 Velour system or 3 haste cards that won’t guarantee the orbs you need (Kakkab is the only one that accomplishes this and he only generates 5). The multi-Velour system for the combo+ awakening is also very prone to hazards. For now I’m not rating this highly. The awakenings are pretty poor and forces a system for consistency. You could technically also use a Skyfall system (Zaerog) but at that point I’m not seeing the value of the leaderskill compared to others since you completely miss out on what seems to be the focus of her kit (the combo+). All this to say that as a leader, I believe she missed the mark on being meta breaking. This comprises of the subjective strength of the leader skill, the awakenings and active skill with respect to the leader skill. Hands down the best overall kit as a lead. Her “fast” charging quad active with general damage awakenings that can handle any dungeon effectively with the right subs makes her a strong leader. It’s by far the easiest lead to play while pushing out good damage. 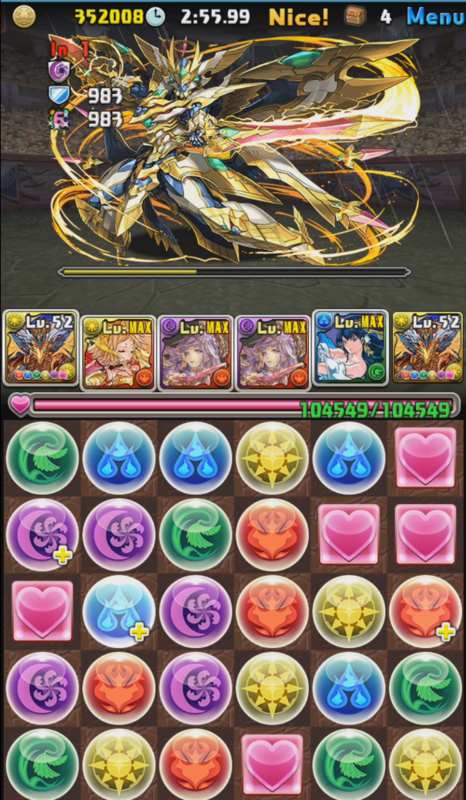 Excels far past other leads for speed farming dungeons like A3. Speaking purely from the perspective that she can have systems to put out an easy 324x per turn, she is a decently strong leader. However I discussed the pitfalls of systems for end game and anyone reading this for guidance on where to allocate Godfest rolls for chances at 7s won’t be running the 5 Velour system. An uninteresting lead doesn’t excel at anything. Seems she was purely designed as a sub for VDP purposes. She finds her way into a lot of my builds and this will probably remain as such for the foreseeable future. She simplifies a lot of the cases I need VDP (see Mowa carries for an example). Having an efficient all-in-one is never lost. Throw a Nicol Bolas equip on her and she becomes unbindable and has a 100% shield for use in end game dungeons. The only triple 7c FUA (excluding super awakenings) hampered mostly by her very long active that does not synergize with all that much in the current meta. She also has a lot of competition from 2x7c and 2+1x7c FUa cards like Amatsu and Kyo. Putting this in 4th because I don’t know why you would sub her over lead her for rainbow. I’m not placing her 4th because she doesn’t have as much to offer as a sub than the other 3, but if you’re running her as a sub for a non-rainbow team (that has all attributes) for the purpose of her active then it’s very niche, hence, 4th. Literally a potato bogged down in both forms given her active and that super Rodin is more common than she is with as much or more value. The Witches provide some interesting value but they’re really not all that game breaking. I would say Reeche is the closest to being broken. Rolling is always at your own discretion and I wanted to write this mostly because I was always being asked about my thoughts on these cards being the shiny new rarity in the normal REM. Zela is a really nice FUA but suffers from the long active syndrome and has other close competitors. Poor lead. Reeche has amazing synergy between her active, leaderskill and awakenings. Great card overall. Madoo is mostly a really fast and easy lead for easier content but will fall off really hard for late. Saline is one of the best VDP options and a better-than-Ganesha exp boost. Her active is bad for assist purposes (on someone or on her) but makes for easy setups for VDP. Velour is super awkward and seems designed to work in multiples but even then doesn’t seem that good. Is a better Morrigu which isn’t saying much.